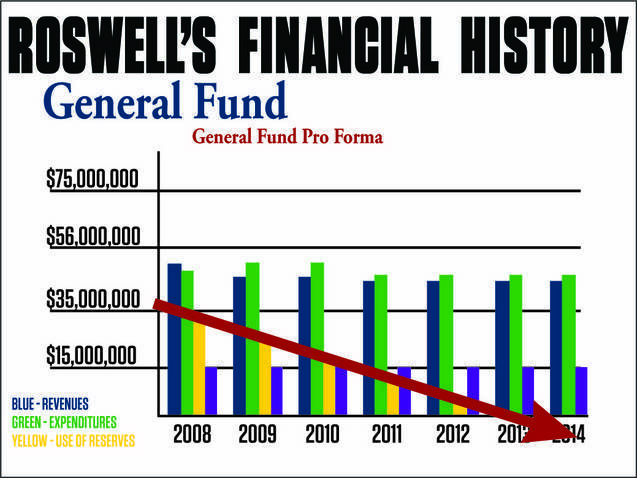 Please see the above photo of the Financial History of Roswell. This was provided to me by the Current City Budget Director, Keith Lee during the FY2011 budget hearings. There is absolutely no way to frame this in a positive light and for the incumbent to state that the council has been “preserving a balanced budget” is the height of deception. To further state in the Georgia Voters Guide on the AJC Website (http://www.thevoterguide.org/v/ajc11/race-detail.do?id=221392494) that Roswell continues with “sound spending practices and maintenance of healthy reserves” is untruthful. The truth of the matter is that by the end of next year all your savings will be gone (Red Arrow) . And prior to using “Reserves by Policy” (purple bar graph) which BY CITY POLICY is only to be used in the event of a catastrophic natural event (i.e. tornado, flood, etc) this current Council will be forced to rack up debt to the maximum of the carrying capacity of the current bond millage rate. The city’s AAA bond rating is dependent on these reserves by policy. But once the city is leveraged to the hilt this administration & council will be able to spend this safety net of money. To facilitate this objective these funds have conveniently been renamed, just this year, as “sustainability reserves” so that any reference to the fact these savings are specifically earmarked has been eliminated. When the dust settles after the election the current council will call for a General Obligation Bond in the amount of $40,000,000. The reason they will do this is because the current Council is morally incapable of reducing expenses. So they will rack up debt for younger citizens of Roswell to pay. Please vote Tuesday November 8th. This entry was posted in Politics is Local and tagged becky wynn, lee fleck, Roswell Budget, roswell city council post 2 on October 13, 2011 by Jessica Szilagyi.